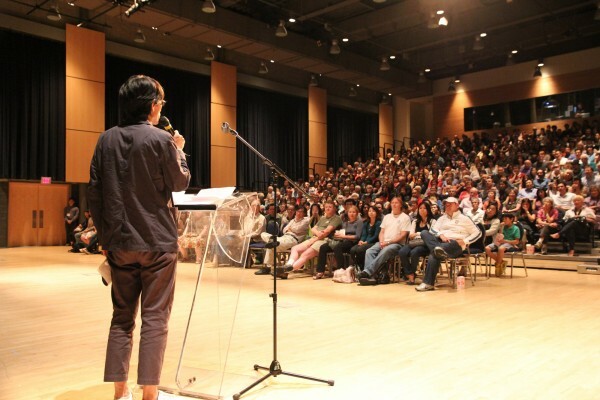 Seats were hard to come by at this year’s Toronto Japanese Film Festival, which saw over 5,000 in total attendance. Alongside special performances and demonstrations of taiko, tea ceremonies, and sword cutting, this year’s expanded festival exceeded viewers’ expectations. One of the definite highlights was the appearance of director Daihachi Yoshida, Winner of the 2012 Japanese Academy Award for Best Film and Best Director (The Kirishima Thing). He was on-hand to introduce and take questions about his film, which made its Canadian debut as the popular closing night screening. A wide variety of films were shown and it was a sellout sequel to last year’s inaugural festival. Here is a recap of some of the films we saw this year. In the late 1800s, with the country modernizing, police are cracking down on wandering ronin. Their attempts to bring law and order to Japan keeps slipping through their fingers, and something sinister is on the horizon. In this new world, the opium trade is flourishing and guns are quickly replacing the sword. Ruroni Kenshin, based off of a manga created by Nobuhiro Watsuki, opens in January 1868 at the Battle of Toba-Fushimi. Unlike serious samurai films, this adaptation revels in its theatricality. Samurai burst through crowds of soldiers like they are the comic book characters they are based on. They flip through midair over tens of people slicing away. They kill with blood spurting onto the ground. In other words, it’s a lot of fun. One samurai in particular, Bottosai, makes short work of his enemies on the battlefield. His sword hungers for blood, but when the battle is over he drops his blade and stumbles into the woods. Ten years later, away from the battles and bloodshed, he reappears, and this is when the film’s beautiful colours really shine through. Red flags, the pink hues of Sakura trees, and green kimonos flood most scenes. It’s a treat for the eyes and the soundtrack is a treat for the ears, though what you’re focusing on is Bottosai’s transformation. At first appearing as a remorseless killer and then as an innocent wanderer, his character leaves audiences guessing throughout the film. Taking on a new name as Shiren the Wanderer, he goes from samurai to bystander in a heart beat. When the samurai class was abolished, wandering ronin who could fight had little else to do with their skills. What are you supposed to do when swords are illegal? Hired as mercenaries by the film’s antagonist, they languish in a field serving as hitmen, but some of them are a little more threatening than others. One who has taken the name Bottosai, not the same as the would-be protagonist, uses his sword-spirit technique to paralyze his enemies. But the question remains: when there are two Bottosai, who will prevail when they meet? Like any Japanese film depicting samurai, Rurouni presents a binary contrast. Despite being a warring class, the samurai also had a set of commandments – such as protecting the innocent, fighting with honour, and living bound by tradition – that still resonate with audiences. Modernization brought law and order to Japan, but it also brought corruption through the drug trade and militarization. It changed everything and the film shows, somewhat unrealistically, the samurai mentality to adapt. It’s part of a bygone era and the sensibilities of the samurai have been corrupted. Shiren has chosen the path to abstain from violence and to believe the sword can be a weapon of peace, not only war. The blade he uses is even blunted on the curve, symbolically showing how he abstains from violence. He finds however that his transformation into a peace-loving wanderer isn’t a simple task. Samurai films like these really are more fun than they are serious. Ruroni Kenshin is certainly a case where suspension of disbelief plays a big part in its story and setting. No samurai warriors have the ability to stop another dead in his or her tracks, but the spectre of the samurai class certainly lingers over characters in the film. Highly successful in Japan, it is a lovingly adapted tribute to the manga it is based off of. With insane fights, a ferocious soundtrack, and a story that will keep you riveted, Ruroni Kenshin is quite a film. Is it possible to see all of Japan in one day? In a week, you could travel the whole distance of the country, but only in a lifetime could you really feel like you understand it all. Documentary filmmakers Phillip Martin and Gaku Narita tried to do just that using footage from 200 different cameras to create a tapestry of Japan in the form of a stunning montage. Each family was asked to document a day in their life, but in the midst of Japan’s recovery it makes for an emotional and perspective-changing experience. In 2011, a massive earthquake hit the coast of Japan near Fukushima. The ensuing tsunami destroyed cities, took lives, and sent the city’s nuclear reactor into a near-meltdown state. On March 21, 2012, the cameras turned on and the families got out of bed to document their lives on this special, somber anniversary. From watching Japanese families making breakfast, going to work on the train, running on the beach, and praying for loved ones, the film gives viewers a whole day from dawn to dusk to watch over. The real stories of loss were the most eye-opening parts of the documentary. One section of the film followed an electrician as he went about his everyday life. Living in temporary housing, he works everyday to move forward with his life. In the disaster, he lost his mother, father, wife, and daughter. The heartrending realization for the audience accented the film’s somber, yet hopeful tone. While focusing heavily on the filmmakers’ efforts to rebuild their lives, the film also offers a view of protestors demonstrating against nuclear power plants, marathoners running to support victims, and children living, loving, and fighting with their parents. For anyone who has been to Japan, the film elicits nostalgia and for anyone who wants to go this film will be the kick to get out of the door. The resilience and compassion of the Japanese people in the wake of the earthquake and tsunami of 2011 is the true character of the film. At times heartbreaking and at others heartwarming, Japan in a Day is a stunning collection of the works of 200 amateur filmmakers in the wake of one of Japan’s worst disasters. I’ve never had a hero grow on me quite like Nagachika Narita. Set in the late 15th century, The Floating Castle is part period-film and part action-comedy epic. During the reign of daimyo Toyotomi Hideyoshi, one castle decided to stand up against his efforts to unite Japan. Oshi Castle and its 500 men are set to defend themselves from the regent, but their leader is a little off kilter. Portrayting Nagachika Narita is actor and Kyogen theatre performer Mansai Nomura, and he brings his theatrical techniques to the film, though it can be a little off-putting for anyone who doesn’t know to expect it. it adds to the eccentricity and likeability of Oshi Castle’s castellan. Known as “Lord Bone” to his vassals, Nagachika is an odd character often preferring the company of the farmers to spending time in the castle learning how to properly govern his land. His father’s health is failing day-by-day and when word comes that the regent is sending 20,000 soldiers to take over Oshi Castle it’s too much for him to take. As the only castle that historically fought back during this period in time, Oshi Castle makes for an interesting setting for the characters. Determined to keep their identity as Warriors of the East, Nagachika’s warriors valiantly fight against extreme odds. Izumi and Sakamaki are two examples of characters who are opposites, but interact well with one another in the film. During the first siege, Izumi charges out into battle. He uses his brute force to scare the enemy, but when overwhelmed he relies on the tactical strategies of Sakamaki. This kind of duality exists in almost every character duo in the film. Nagachika plays the fool while Tanba, his top warrior, levels him off with his sensibility. It’s a film that focuses heavily on traditional forms of storytelling when looking at this historic battle, and it works well for the audience. Laughs went up at all of the right times during the performance and groans whenever Nagachika did something ridiculous. The best part of the film, however, was at the very end. During the credits, the audience gets to view the actual site of the battle. It brings a kind of prescience to the events making the audience realize that it did actually happen. It’s really no wonder why The Floating Castle was nominated so many times during the Japan Academy Awards, and why the audience enjoyed the film so much. The mix of action and Kyogen performance makes the film a uniquely different kind of period film about samurai and daimyos. Unlike Seven Samurai or Chushingura, The Floating Castle is fun and even funny at times.